As of mid-November, ISON is officially upon us. Using Hubble, we've taken our closest look yet at the innermost region of the comet, where jets of sublimating ice are fueling a spectacular tail. the chip gap: a horizonal dead zone in the middle of the image. As we expect, the spherical coma around ISON's nucleus is blue and the tail has a redder hue. That's in part because of reflected sunlight: dust grains in the tail reflect more red light than blue light, while gas in the coma reflects more blue light. But the coma is also glowing blue-green on its own, as its atoms catch solar energy and re-emit light according to their unique spectral characteristics. estate on the sky, both because it's physically growing and because it's getting nearer to us. Of course, our eight-month retrospective pales in comparison with ISON's own journey, which started some 10,000 years ago in the Oort cloud -- and might end in a fiery wreck as ISON hugs a tight turn around the Sun on November 28. With that long trek in mind, it's time to appreciate where we are. 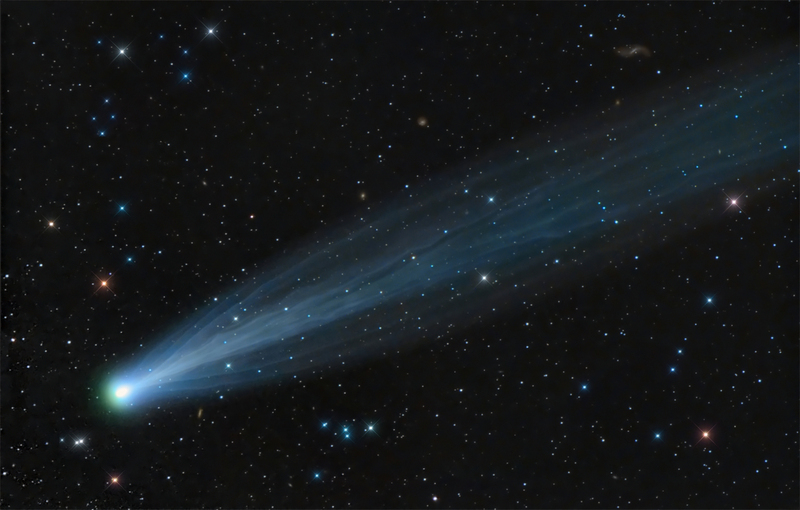 We're in the Golden Age of Comet ISON. Thanks to a jump in brightness late last week, the comet can now be seen with unaided eyes for the first time. Barring the aforementioned catastrophe, it looks to stay visible until mid-December, although it will stay close to the Sun, which will make it tougher to see. An image of ISON's full extent, with an imprint showing the area of our newest Hubble image. What's remarkable here is that the entire ISON, this awesome, shimmery space tadpole, is being produced from a dusty ball of ice estimated to be a few kilometers in diameter. Compared to ISON's full extent, Hubble's latest image is tiny. It only shows the very base of the tail. Yet even in this closest closeup we've ever had, a single pixel spans 24 km across the comet. Now that Comet ISON is nearby, amateur astromers rule the day. But Hubble observations, including this latest image, are still providing key insights into the science and spectacle of a comet we hope will continue to impress.